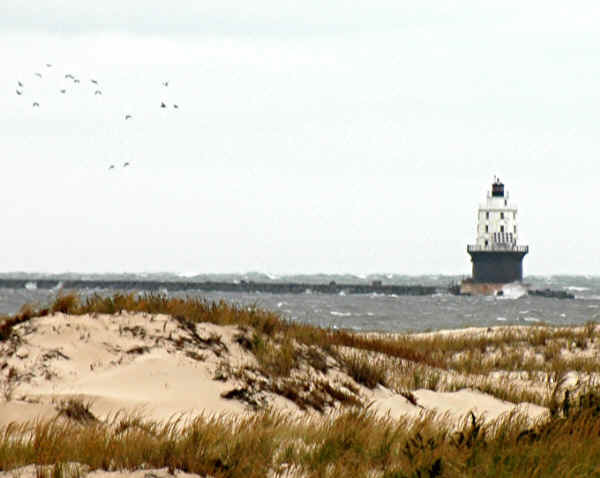 Volunteers -- buoyed by Indian summer weather -- pegged Saturday, Nov. 3, as the day for stripping paint and removing the landing deck at Harbor of Refuge, plugging some holes and fixing windows at Delaware Breakwater East End, and closing both lighthouses for the winter. With forecasts for winds gusting to 40 mph and seas reaching 10 feet, the work trip was definitely postponed. It's tentatively been rescheduled for Saturday, Nov. 17. The hurricane passing well off shore didn't deliver quite the threatened punch. But it was still clear trying to land and work at either of the lighthouses would have been a very bad idea! 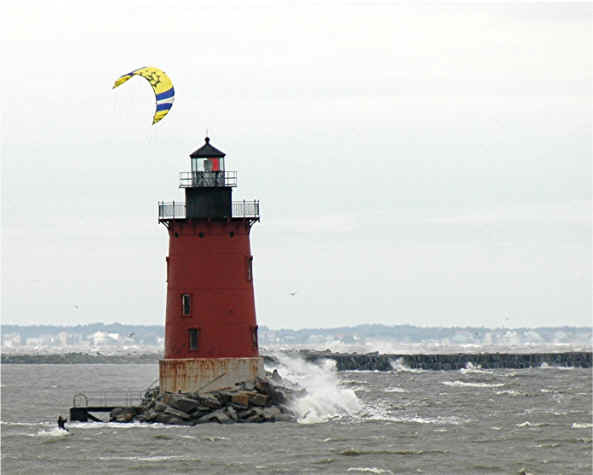 Around noon, when these photos were taken, it appeared Delaware Breakwater East End Lighthouse was taking more of a beating than Harbor of Refuge. But high tide was still two hours away and the winds were shifting. It was impossible to tell from shore whether there was any damage at either lighthouse. The Foundation is especially concerned about the new landing deck installed at Harbor of Refuge this spring. It was scheduled to be taken up on the cancelled work trip to protect it from just exactly this kind of assault.